After wine tasting at some of the Chateauneuf-du-Pape caves, we got back in the car with no set destination and just drove through the countryside. The landscape was breathtaking - fields of vines as far as the eye could see - and it was so much fun to just explore and get a feel for the area. At some point, we started to see signs for Orange, a town we had read about but wasn't necessarily on our itinerary and we decided "why not?" Orange is not a big tourist destination, it is not as quaint as Avignon and it is clearly a town where people live. However, it does have some incredible history. The town was built by the Romans in 35 B.C. as a town where Roman officers could retire. As a result, Orange has two incredibly well-preserved pieces of Roman architecture still standing. It has an Arc de Triomphe that was built by Augustus some time between 27 B.C. - 14 A.D., and it has the best preserved Roman amphitheater in all of Europe. Both were well worth the visit, and easy to see even if you only stop for the afternoon. Just 20 minutes down the road from Avignon is the town of Chateauneuf-du-Pape, home of the famed Chateauneuf-du-Pape wine. The town is tiny, only 2,000 people live there year round, but there are wine caves for you to indulge in a tasting on every corner. The day after we arrived in France/Avignon, we drove to Chateuneuf-du-Pape in search of wine. We did not plan enough in advance to visit any vineyards, but our afternoon in CDP was perfect nonetheless. We spent a half hour at a small wine museum learning about the wines of the Rhone valley before heading to the top of the town for lunch at Le Verger des Papes. The restaurant has a gorgeous view that looks out over the countryside and it serves a 20 Euro, three-course lunch. We had a duck salad to start, pork and potatoes for an entree, and a fig tarte to finish, all while taking in the gorgeous view and enjoying the sunshine. It was really perfect and I highly recommend fitting this into your trip if you end up in the town. After lunch, we walked off our meal around the town. The ruins of a medieval castle commissioned by one of the Avignon Popes sits above the restaurant at the top of the town. In addition to strolling, we of course did some wine tasting, which was a total success - we couldn't resist shipping a box of wine home. Our first stop was Avignon. We flew into Nice, rented a car and, despite being totally jet-lagged, drove two and a half hours across Provence to Avignon. Avignon is not a large town, but it serves as a great jumping-off point from which to visit other towns and tourist destinations in the area (think Arles and Pont-du-Gard). At the center of the town is the breathtaking Palais des Papes, which served as a castle for two Popes in the 14th century. We stayed at a lovely B&B, Le Limas, which is run by a woman named Marion Wagner. Our room was large, modern, and airy, and Marion provides you with a simple and delicious breakfast every morning on her roof, which looks out over the town. We highly recommend the B&B to anyone thinking of visiting. While there is not much to see within Avignon (visiting the town is more about taking in the scenery than about visiting specific sights), we did make the requisite visit to Les Halles, the town's market. The market is indoors and you are welcomed at the entrance by an impressive living wall. Unlike markets we've visited in other cities, like La Boqueria de Mercat in Barcelona or Union Market in DC (my hometown! ), which are built as much for tourists photos as for grocery shopping, Les Halles is truly a local's market. It isn't pretty, and it isn't overflowing with people. Instead, it is full of locals getting their every day groceries. The stalls have incredible breads, cheeses, meats, fruits, etc., but the fare is presented for purchase, not Instagram. We sadly did not have any reason to buy food in Avignon, but we were definitely tempted by the cheese options, and the prices (a circle of goat cheese that will run you $10 at Whole Foods goes for 2 Euro in Avignon). At the end of August, Kyle and I spent eleven days in France celebrating our one year anniversary. We rented a car and drove all over Provence and the Cote d'Azur. We made it to eighteen different towns and we fell head over heels for the south of France. I have been slowly editing photos of our vacation and I'm ready to start sharing. Over the next few weeks I'll be posting photos and a little bit of information on the towns we visited - I hope you enjoy! A friend recommended that I take the New Berlin tour when I first got to the city and I fully second that suggestion. New Berlin Tours are free daily walking tours of the city (but tips are expected). They are about 3 hours and are a great way to introduce yourself to Berlin's history. The tour takes you to some of the major sights - the Brandenburg gate, the Holocaust memorial, the Berlin Wall, Checkpoint Charlie, etc. - and the tour guides are extremely knowledgeable. One of the must-see spots that is not included on the New Berlin tour is the East Side Gallery. Created in 1990, the East Side Gallery is an outside gallery painted on a 1.3 km stretch of what's left of the Berlin wall. Though many of the paintings are covered in graffiti, the images are iconic and a walk along this section of the wall shouldn't be skipped. We arrived in Berlin on the last day of the city's Festival of Lights, which runs the first two weeks of October. The city sets up 70 projectors at many of its large landmarks throughout the city and projects art and graphic design onto buildings. The designs are gorgeous and there is a party atmosphere in the air as you walk through the streets. Ishtar Gate, the Pergamon alter, and the Market Gate of Miletus. 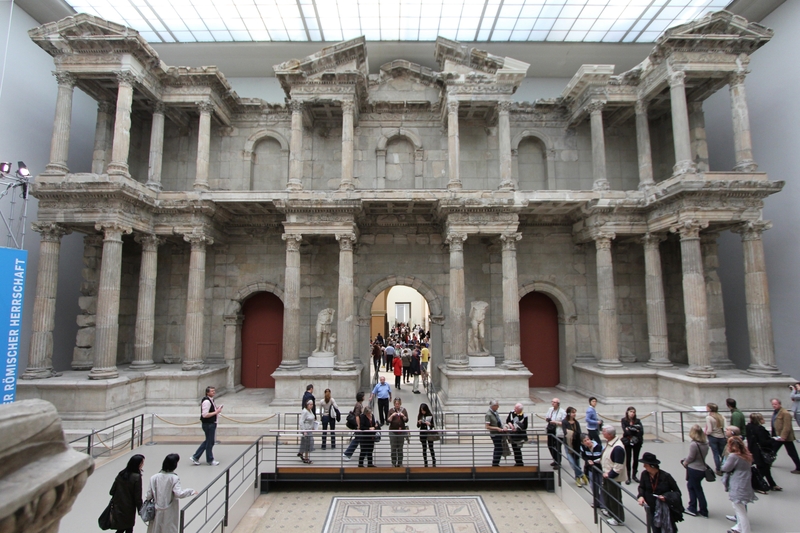 The museum is on Museum Island and can be seen in an hour and a half to two hour visit. Beyond seeing the East Side Gallery and museums on Museum Island, the streets of Berlin are an art gallery in themselves. The walls of the city are covered in vibrant street art that is as exciting as anything you see in museums.